The Pay Per Post add-on allows you to charge members a set price each time they publish a piece of content to your website. Pay-per-post prices can be set per membership level. Pay Per Post is a great way to grow your community while being profitable. You can offer free memberships while still generating revenue each time your free members publish content. SSL Certificate: An SSL Certificate must be installed on your website for security precautions. 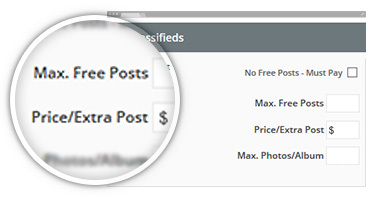 Limit Posts Per Member: The Limit Posts Per Member add-on must also be installed on your website for the Pay Per Post add-on to function properly. The Pay Per Post add-on will function properly once these two additional add-ons are installed on your website.